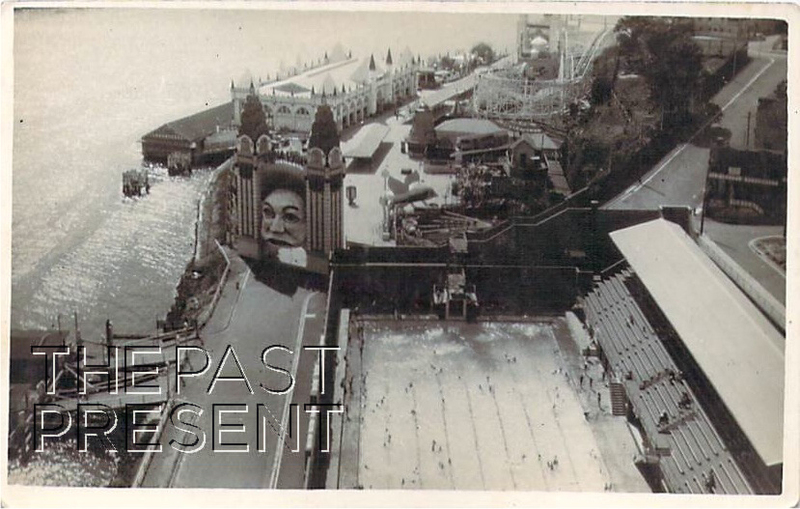 This week, with Summer Holidays in swing, the Past Present examines the historic Sydney Luna Park, a favourite holiday destination for Sydneysiders and visitors alike for generations. This image is from either the late 1930s or 1940s and you might recognize some of the structures which are still there today! During the building of the iconic Sydney Harbour Bridge, the site where Luna Park stands today was taken up by large workshops where parts of the bridge were made and assembled. In 1932, with the bridge complete though, the workshops were demolished and in 1935, only three years later, Luna Park opened. The park was based on the successful fun park of the same name opened in 1903 on Coney Island, New York by Herman Phillips, though it was not the only or even the first park to trade on this original ‘Luna Park’. Melbourne’s Luna Park had opened in 1912 and there were Luna Parks in other countries too. Luna Park Sydney originally traded using rides which had been relocated from Luna Park Glenelg, in Adelaide. Not only did it use rides from another park though, it used the knowledge gained through the previous parks to ensure immediate success. Throughout the 1930s and World War Two Luna Park continued to attract crowds and in the 1950s and 1960s various new rides were installed, many of which had been seen on trips overseas by David Atkins, who operated the park until 1957 and Ted Hopkins who ran the park until 1969. In the early 1970s the group responsible for the park attempted to redevelop the site without success and investment in the infrastructure and rides was very limited. Then, in 1979 disaster struck with a fatal fire on the Ghost Train resulting in the closure of the park. Over the following years the fun park opened and closed sporadically, but in 2004 Luna Park reopened for good, we hope! This entry was posted in New South Wales, Sydney and tagged 1930s, 1940s, entertainment, industry, leisure, postcard collection, sydney harbour, tourism.